Looking for a hilarious, just for fun magic show. This show can be tailored for any age group. It is terrific as an award show, as a celebration after a fundraiser, and can even be themed as a kick-off for fundraisers. We also offer this show for after-school groups or special events. The show is typically 30 or 45 minutes in length, but we can customize it to fit your schedule and need. The assemblies that you presented two days before the show were also wonderful for our students. 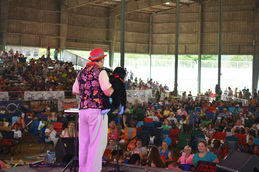 The Buddy Blast Off show about making friends was fun and engaging for everyone. We hope to partner with you in the future for upcoming events. The Magic for Miracles night was an easy fund raiser for our school through which we raised over $1,000. We also appreciated the opportunity to help the local food bank in such a powerful manner. You provided all the materials and posters for the event and we appreciate your effort in helping make it a success for us. Complete this form to book your show or ask for more info!